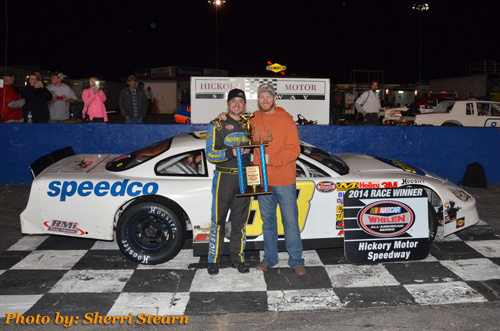 (Newton, NC - - Oct. 29, 2014) Josh Berry enjoyed a memorable celebration in Victory Lane after picking up the win in the Annual Coca-Cola Fall Brawl 150-lap feature event for the NASCAR Whelen All American Series Bojangles' Late Models. Monty Cox (No. 21 - Gold King Limited Late Models), Ben Ebeling (No. 22 - Street Stocks) and Kyle Bonsignore (No. 0 - Bench-Built Transmissions Sportsman Racing Classics) also celebrated in Victory Lane following their individual wins. Josh Berry (No. 88) earned the pole position for the Bojangles' Late Model feature event, and slowly began pulling away from the 23-car field during the early laps. Berry remained out front until lap 20 when the No. 75 of Landon Huffman took over the top spot. But that would be short lived as the No. 25 of Matt Piercy would move into the lead just 4 laps later, with the No. 00 of Shane Lee and the No. 23 of Payton Ryan following in 2nd and 3rd. Berry would return to the top position on lap 89. Berry survived multiple caution periods and restarts to pick up the win for the Annual Coca-Cola Fall Brawl. Ryan, the No. 8 of David Garbo, the No. 9 of William Byron and the No. 59 of Coleman Pressley finished second through fifth, respectively. The No. 12 of Evan Duggins picked up the pole award for the 50-lap Gold King Limited Late Model race and went on to lead the first lap before being over taken by the No. 51 of Jeremy Pelfrey. Pelfrey slowly began to pull away from the field during the early laps, until the No. 17 of Kyle Mansch would spin coming out of turn four bringing out the caution. Back under green-flag conditions, the No. 21 of Monty Cox and Pelfrey raced door-to-door for several laps until Cox settled into the top position on lap 21. The No. 7 of Taylor Stricklin challenged Cox for the lead following a lap 46 restart. Cox managed to hold on to the lead and went on to the pick up the win. Stricklin, Duggins, Mansch and the No. 6 of Brandon Setzer rounded out the top five. The No. 31 of Wayne Edwards led the Street Stock field to the green flag for the 40-lap event and quickly pulled away from the competition. As Edwards remained out front, the No. 22 of Ben Ebeling worked his way from the back of the pack to the second position by the halfway mark. With 10 laps remaining, Ebeling had worked his way to the bumper of Edwards and began to challenge for the lead, working his way to the top spot with just two laps to go. Ebeling picked up the win, leaving Edwards to settle for a second-place result. The No. 3 of Chase Pollard, the No. 03 of Kevin Eby and the No. 64 of Marshall Sutton completed the top five. The No. 0 of Kyle Bonsignore brought the field to green for the 25-lap Bench-Built Transmissions Sportsman Racing Classics event. Bonsignore quickly began to pull away from the competition until the No. 16 of Bill Webb spun heading into turn two, making contact with the outside wall bringing out the first caution. As green-flag racing resumed, Bonsignore shot back to the lead leaving the rest of the field in the chase behind him around America's Most Famous Short Track. Bonsignore went on to lead all 25 laps of the race before picking up the checkered flag, leaving the No. 74 of Bob Park, the No. 8 of Bob Hapemen, No. 48 of Larry Benz and the No. 2 of Don Fenn to round out the top five. Hickory Motor Speedway would like thank all of the Sponsors, Competitors, Fans, Officials, Workers and everyone involved with this facility that help us to be Americas Most Famous Short Track. The 2015 schedule will be coming out soon and we look forward to seeing you at Hickory Motor Speedway next season. The track will remain open for off season testing. www.hickorymotorspeedway.com or like us on Facebook ( www.facebook.com/hickoryspeedwayfans ) and follow us on Twitter ( www.twitter.com/hickoryspeedway ).